My name is Peter Rosenbladt and I am a retired Computer Engineer. 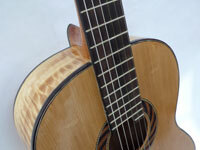 I have made Classical Guitars since 2003. What attracted me to becoming a luthier is the combination of physics, engineering, art and craftsmanship required to make a musical instrument. I love the Spanish or Classical Guitar because I play it and because of its long history with Spanish makers like Antonio de Torres Jurado (1817-1892), José Ramírez (1858-1923) and others, their art later refined and modernized by the famous German maker Hermann Hauser (1892-1952). The tradition of the Spanish Guitar was held up and further developed in the U.S. by outstanding makers like Manuel Velasquez (born 1917 in Puerto Rico who moved to New York) and John Gilbert (1922-2012) in California. 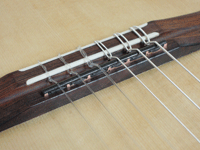 The modern Classical Guitar uses Nylon strings while the American guitar uses steel strings. Due to the lower tension of the nylon strings it is well-suited for finger-style playing and has a warm and mellow sound. Today musical instrument making in America is highly developed, and there are many skilled luthiers at work in many parts of the country. The Guild of American Luthiers has many hundred members, and I have had the great benefit of learning from some of its most famous members such as Charles Fox, Richard Prenkert, John Gilbert and Ervin Somogyi. 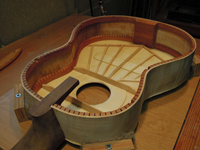 Building musical instruments is a never-ending struggle for perfection - much like making music. Practice makes it get better, but it is never perfect. 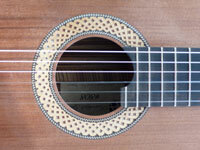 If you are interested in getting a hand-made custom Classical Guitar please look at my Considering a custom-made guitar? page.